To determine whether early imitative responses fade out following the maturation of attentional mechanisms, the relationship between primitive imitation behaviors and the development of attention was examined in 4-month-old infants. They were divided into high and low imitators, based on an index of imitation. The status of attention was assessed by studying inhibition of return (IOR). Nine-month-old infants were also tested to confirm the hypothesis. The IOR latency data replicate previous results that infants get faster to produce a covert shift of attention with increasing age. However, those 4-month-olds who showed less imitation had more rapid saccades to the cue before target presentation. The cortical control of saccade planning appears to be related to an apparent drop in early imitation. We interpret the results as suggesting a relationship between the status of imitation and the neural development of attention-related eye movement. Meltzoff and Moore  studied imitation by showing human neonates some adult facial gestures. Imitative responses were frequent at birth and decreased at approximately 2- to 3-months of age [2–4]. Bower  gave neonate imitation as an example of repetitive processes in development, in which the infant acquires certain skills, loses them and then acquires them again as s/he grows. In spite of the fact that the imitation ability manifests itself at birth, it soon seems to disappear, reappearing only toward the end of the child's first year. To date, although the literature contains some accounts of the dropout of neonate imitations [2, 6, 7], the question has not been explored from the standpoint of developmental neuroscience. Rizzolatti et al. speculated that a "mirror" mechanism, similar to that for a particular class of visuomotor neurons, could represent the simplest neural mechanism for many behaviors, such as imitative behaviors. These neurons, originally discovered in the ventral premotor cortex of monkeys, discharge both when the monkey performs a particular action and when it observes another individual making a similar action . Thus, the neural "mirror" mechanism might allow a direct matching between the action observation and its execution. Various findings support the existence of this mechanism in humans [10, 11]. Rizzolatti et al. , for example, refer to these behaviors represented by a "mirror" mechanism as "resonance behaviors", in which an individual reproduces overtly or internally an action similar to that of another individual. Two types of resonance behaviors were distinguished. The first type is that in which an individual repeats overtly a movement made by others in a quasi-automatic way. The second type is that in which the activation of neurons coding motor actions occurs in response to an observed action, but the observed action is not generated overtly. Its purpose is to generate a representation of the goal of an action. Neonate imitation, together with the fixed action patterns of birds and adult actions related to emotional life, is thought to belong to the first type . A typical example of a resonance behavior of the above-mentioned first type is the imitative behavior of animals observed on particular occasions. As the best studied example, Rizzolatti et al. give the behavior displayed by shore birds when alarmed. Typically, one or a few birds start flapping their wings, then others start reproducing it and, consequently, the whole flock flies away. However, an important difference was suggested between this contagious behavior of birds and neonate imitation, one of the human resonance behaviors of the first type, namely, the control mechanisms storing the externally evoked response and inhibiting its emission . These could be present in humans as well as in most evolved species of animals. Imitation behavior of infants might also occur, because these control mechanisms are not mature. Typically adults do not repeat overtly an observed action. Neuropsychologists have identified several imitative behavioral syndromes in adults. Lhermitte  has described imitation behavior as a clinical sign associated with a frontal lobe damage, suggesting that a release of a covert resonance phenomenon could be inhibited by frontal cortical areas in adults. Recent functional neuroimaging studies also indicate a top-down effect on the brain regions related to motor resonance in adults . In other words, early imitation may disappear after infancy following the development of cortical control. On the other hand, the control mechanisms which store the responses and delay repetition appear to be already present in infants, although their cortical mechanisms are immature . The neural basis for imitation in the newborn population has not been frequently studied , but it has been proposed that the child's early imitation uses mainly subcortical regions including the superior colliculus via multimodal sensory mapping . Accordingly, before cortical development, some subcortical mechanisms of inhibition could be related to the early control or reduction of imitative responses. The present study examines the hypothesis that early imitative responses disappear following the maturation of a form of inhibition. By observing eye movements, we examine visual attention, which has several maturing aspects at four months of age, including the ability to disengage and move to a stimulus and the ability to inhibit. To assess the status of inhibition, we study inhibition of return (IOR) which is a bias against reorienting attention to a recently attended location . This inhibitory aftereffect encourages orienting towards novel locations and makes search of the environment more efficient . It is suggested that IOR is an attentional process and that the superior colliculus is involved in its manifestation [16, 17]. It is reported to develop rapidly between 6 and 16 weeks . The original design provided 4-month-old infants with both IOR and facial imitation tasks. Additionally, 9-month-olds were assessed in order to explore the relationship between the infant imitation and the maturation of a form of inhibition. Nine months is considered to be a major transition point of visual attention . Besides, at 9 months, but not before, infants begin to tolerate longer delays between initial exposure to the action of others and subsequent tests of recall . In a pilot study, we found that it was extremely difficult to make socially adept 9-month-olds focus on a single elementary act, for example, a mouth opening. Thus, for assessing imitation at 9 months, we decided to conduct the immediate imitation task on objects, instead of the facial imitation task. Nine-month-olds were reported to be able to imitate certain simple actions with novel toys immediately . On the other hand, as nine-month-olds were reported to be able to perform deferred imitation on objects successfully , in other words, inhibit an observed action, the less immediate imitation we could observe, and the more mature form of inhibition subjects showed. Since the development of attention is thought to have a relationship with individual differences in temperament , mothers of all infants filled out the Infant Behavior Questionnaire Revised (IBQ-R). The IBQ-R is a caregiver or parent report for assessing individual differences in emotional and motor reactivity and self-regulation . The link between early imitative tendencies and temperament was suggested by Field . In the initial study of 4-month-old infants, only the mouth opening imitative response was analyzed because three participants could not complete the tongue protrusion session. 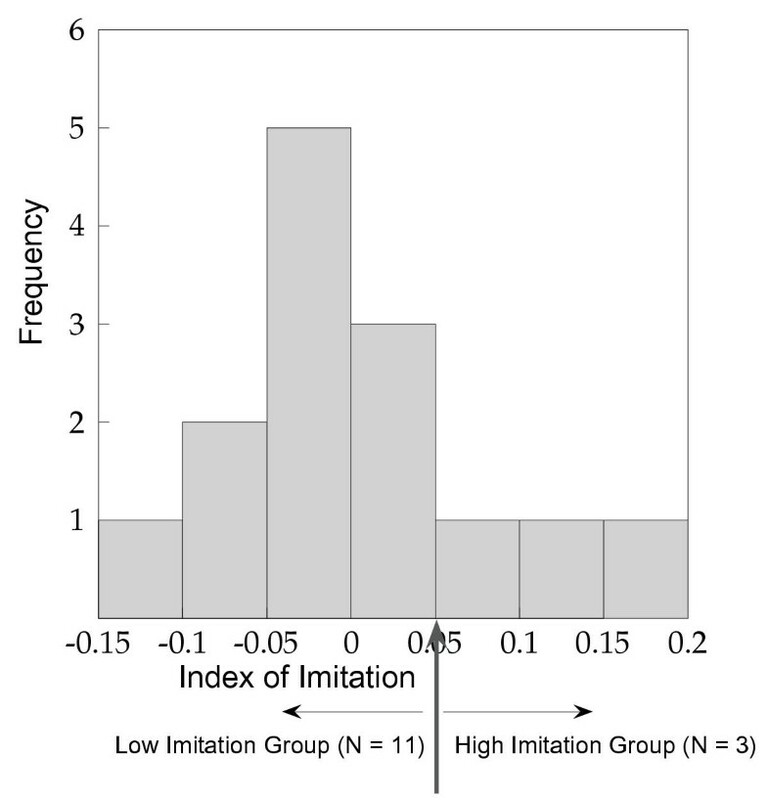 To distinguish infants who show more imitative behaviors, based on the index of imitation, infants whose index was more than .072 (mean+1SD) were judged to be high imitators. By this criterion, three out of fourteen 4-month-old infants (21%, Figure 1) were evaluated as high imitators and 11 as low imitators. This seems consistent with the downward trend of imitative responses during the first 6 months of life [3, 24]. Distribution of the index of imitation. On the other hand, all 9-month-old infants were evaluated as low imitators by the criterion. The mean (SD) of infants' score was 1.2 (0.63). This might be consistent with the report that infants at 9.5 months of age did not demonstrate immediate imitation of actions, although after a 24-hour delay, they demonstrated significant imitation of actions . Reaction times (RTs) over 2 s or under 200 ms were excluded from the data analysis for IOR, following Johnson et al [26, 27]. The number of scorable trials was 12.6 ±3.83 for the 4-month-olds and 12.6 ±3.02 for the 9-month-olds. For each subject the frequency of looking to the cued or opposite targets for the two SOAs was counted. 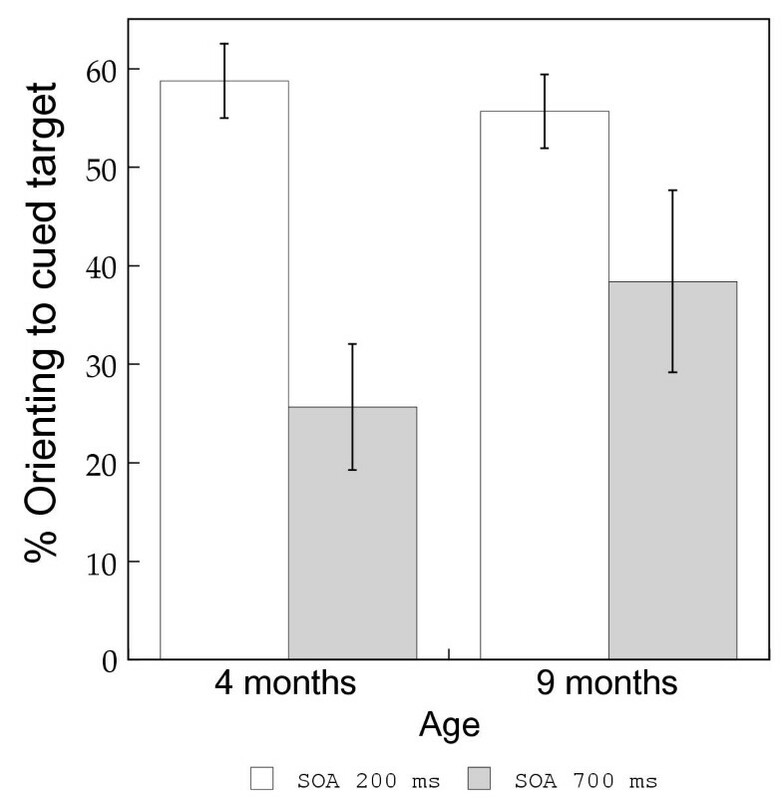 Figure 2 shows the group mean for the percentage of orienting to the cued targets at the two SOAs for the two age groups. An analysis of variance (Age (2) × SOA (2)) revealed the only significant effect of SOA (F(1, 21) = 16.50, p < .01). In both age groups, infants showed significantly greater orienting to the uncued target at the longer SOA. Results for the orientation measure: Group means and associated standard errors for two SOAs and two age groups. The median RT for looking to the cued and opposite targets was obtained for both SOAs for each subject and Figure 3 shows the group mean. The analysis of variance (Age (2) × SOA (2) × Cue (2)) revealed a significant main effect of the cue (F (1,14) = 4.71, p < .05). The interaction between cue and age was also significant (F (1,14) = 4.96, p < .05). 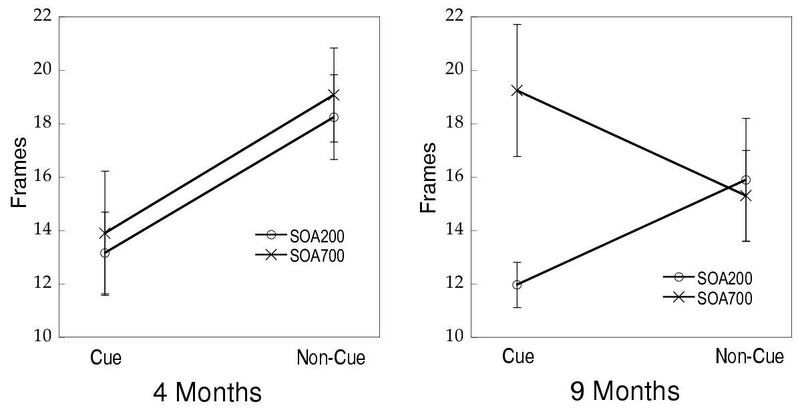 These results revealed that 9-month-olds showed inhibition of the cued target at the longer SOA and facilitation at the shorter SOA, while 4-month-olds showed facilitation of the cued target at both SOAs. Results for the RT measure: Group means and associated standard errors for the two SOAs and two age groups. Following the above-mentioned analysis of IOR, the performances of the two groups divided by the degree of imitation were compared. The number of scorable trials was 14.3 ± 4.16 for the high imitators and 12.1 ± 3.81 for the low imitators. Regarding the percentage of orienting to the cued targets at the two SOAs for the two groups (Figure 4), the analysis of variance (Group (2) × SOA (2)) revealed a significant effect of SOA (F(1,12) = 13.5, p < .01). The interaction between SOA and the groups also approached significance (F(1,12) = 4.04, p < .1). Simple effect analysis revealed that low imitators showed a significantly higher percentage of orienting to the uncued target at the longer SOA (F(1,23) = 8.18, p < .01). Results for the orientation measure: Group means and associated standard errors for the two SOAs and two groups. The analysis of variance of the median RT (Group (2) × SOA (2) × CUE (2)) revealed a significant effect of cue (F(1,7) = 8.51, p < .05) and group (F(1,7) = 5.82, p < .05). Responses to cued targets were significantly faster than to non-cued targets, and high imitators responded significantly faster than low imitators. In the present analysis, all saccades that commenced less than 200 ms after the target onsets were excluded in order to examine saccades which were likely to have been driven by the targets. On some of these excluded trials, infants could begin a saccade directly in response to the cue. While 100-ms cue presentation rarely elicits a saccade in young infants , rejected trials in which infants looked to one of the screens during the ISI accounted for about 20% of overall trials conducted by Johnson and Tucker . The percentage of our rejected trials in which infants were likely to respond to the cue stimuli directly were 19.3% of the trials for the 4-month-olds and 23.3% of the trials for the 9-month-olds. To explore the group differences between high and low imitators, we analyzed the saccades which were rejected in data analysis for IOR. The number of trials which could be elicited by cue were 4.67 ± 2.37 in the 4-month-olds and 5.60 ± 3.50 in the 9-month-olds. Almost all responses were made to the cued side except a few responses at 700-ms SOA. There was no significant difference between age groups (t = -.80, df = 22). When the 4-month-old infants were divided into high (2.00 ± 1.00) and low imitators (5.36 ± 2.11), a significant group difference was found (t = 2.62, df = 12, p < .05). This group difference was also confirmed through the Wilcoxon-Mann-Whitney Test for small samples  (Wilcoxon's W = 8.00, p < .05). The average scores of 14 scales for the 4- and 9-month-olds are presented in Table 1. The observed age differences in the present study were consistent with those of Gartstein and Rothbart . When the 4-month-old infants were divided into high and low imitators, no significant difference was found for any scale. No correlation was observed between sub-scales and the index of imitation. The present study examined the relationship between primitive imitation behaviors and development of the inhibitory mechanisms in infants, to determine whether early imitative responses disappear following the maturation of attentional inhibitory mechanisms. To assess the inhibitory mechanisms, we observed eye movements in the spatial cueing task. These latency data replicate previous results that the temporal dynamics of facilitation and inhibition changes over the first year of life . While all of the 9-month-olds were evaluated as low imitators by our criterion, it was found that those 4-month-olds who showed less imitation have made more rapid saccades to the cue. Although establishing a temporal correlation between two phenomena does not establish a causal relationship, we suggest tentatively that it is not the inhibition function, as initially thought, but the cortically driven saccade planning , which is most strongly related to the drop in imitation. Is rapid saccade to the cue due to no inhibition? In spatial cueing experiments, Johnson and Tucker  made the important point that infants do not commonly make a saccade toward the cue, but only once the target has been given. 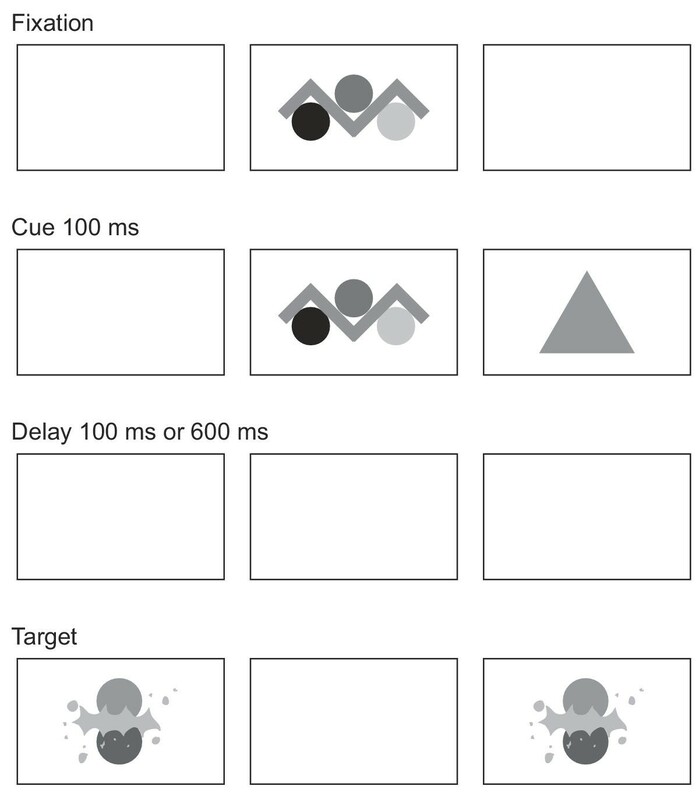 Because if a cue influences infants' later responses to a target without responding overtly, this evidence is consistent with a covert shift of attention to the cue. Rapid saccades toward the cue were considered to be largely dependent on the activity of the colliculus which is already mature at birth. As the frontal eye fields have inhibitory connections to the colliculus, a lesion in this area results in a decrease in latency for exogenously triggered saccades toward the contralesional field . By analogy, an inability to inhibit responses toward the cue might be seen as slow frontal development. However, infants, unlike adults, are not told to maintain fixation. Thus, moving to the cue is neither a failure nor a lack of inhibition for them the way it might be for an adult, and may reflect improved or more mature processing. For example, the reason why some 4- and many 9-month-olds make saccades to a cue may be because they are faster in general. Hood  attempted to establish suitable cues for infants, and reported that several stimulus factors should be examined to produce a covert shift of attention and prevent overt orienting to the cue. Since infant research on the spatial cueing procedure using psychophysiological measurements, such as the ERP, has just begun , the mechanism of saccades made before target onset to the same side of the cue is still rather controversial. In the present study, we discuss observed rapid saccades to the cue as cortically planned saccades . Richards  examined changes in scalp-recorded event-related potentials (ERPs) in relation to the initiation of eye movements toward the peripheral stimulus in a spatial cueing procedure. He found that the presaccadic ERP changes occurred in response to the targets, which were presented on the same side with the cue. This component did not occur for saccades toward a target appearing in a different location than the cue or for saccades toward a target without cue presentation. This presaccadic activity was a positive component in the ERP about 50 msec before the saccade onset, which located over the frontal scalp region. Presaccadic ERP potentials, which might reflect cortically based saccade planning , were observed in 20- and 26-week-old infants, but not in 14-week-old infants. Richards mentioned that the saccade of 14-week-old infants to the peripheral stimulus presented as a cue appeared to be tapping a relatively automatic process, while the saccades of the 20- and 26-week-old infants were cortically driven attention-related eye movements. Richards  also analyzed trials on which the infants looked away from the central stimulus before the target was presented. The saccades occurring before or when no target was presented were heavily biased toward the side ipsilateral to the cue rather than to the side opposite the cue. Besides, before target presentation, more saccades were observed toward the side ipsilateral to the cue than toward either side when no cue appeared. On trials without cue presentation, any saccades toward the periphery occurred nearly equally often on either side. Although the saccades to the cued location that occurred in advance of the target were counted as errors by Richards , these responses were considered to reflect planning on the part of the infant . Richards found no systematic bias for the tested 14-, 20-, and 26-week-olds . However, we speculate that the neural mechanism for these saccades made before target onset to the same side of the cue could be different among 14-, 20- and 26-week-olds. That is, the saccades of the 20- and 26-week-olds could be the result of saccade planning, in which the cerebral cortex is closely involved, while those of the 14-week-old infants could be reflexive and controlled by subcortical systems. Richards  also reported a significant positive ERP activity in 20-week-old infants for both the saccades toward a target in a previously cued location and the saccades toward a location that had been previously cued even without a specific target present. This presaccadic ERP component occurred about 300 msec before the saccade (PSP 300) and was located in the parietal scalp region. The present study found that those 4-month-olds who have made more rapid saccades to the cue showed less imitation. Moreover, the 9-month-olds also showed the same amount of responses to the cue as the low imitators. By 4.5 months of age, infants are able to make cortically driven planned saccades, which are distinguished from reflexive saccades by presaccadic ERP . As the observed rapid saccades to the cue are considered to reflect active cortical planning, it is speculated that early imitative responses could disappear following the maturation of cortical control of eye movement. The cortical area might control saccade eye movement by inhibition and disinhibition of the superior colliculus . On the other hand, the parietal scalp area where the PSP 300 occurred is thought to disengage attention from one location in preparation for shifting attention to another location . The fewer saccades of high imitators might indicate their tendency to focus obligatory attention on the central stimuli and a failure to disengage. In their longitudinal study of neonatal imitation, Heimann et al. noted that their three-month observations had to be shortened relative to three-day and three-week observations, because of the difficulties in maintaining the children's focus and attention in a longer time frame. In light of the small sample, we conclude that the present results should be replicated in a future study. Regarding IOR data on the direction of orienting, both 4- and 9-month-olds made more saccades to the uncued target at 700 msec (Figure 2). This is consistent with a previous study in which both 4- and 6-month-old infants showed a significant change in the direction of orienting between the two SOAs . Moreover, although the interaction was not significant, post-hoc comparison of performance between high and low imitators revealed that low imitators made more saccades to the uncued target at 700 msec SOA (Figure 4). Taken together with the data on 9-month-olds, this might suggest that since the majority of the infants are low imitators, their inhibitory mechanisms in IOR are relatively well developed, compared to those of high imitators. However, our latency data on 4-month-olds do not show that they have IOR, although both the frequency and speed of IOR increased steadily almost together after 6 weeks . Thus, 4-month-olds looked faster at cued targets at both 200-msec and 700-msec SOAs. A possible explanation for the discrepancy between frequency and RT measures is that IOR is not stable at this age , or RT data are highly variable, and with infants it may take too many trials to obtain a reliable measure. Much more investigation is needed to clarify the connection between IOR and imitation behaviors. On the other hand, based on the RT measure, 9-month-old infants showed facilitation to a cued location when a target appeared 200 ms after cue onset and inhibition of responses to the same location when the target appeared 700 ms after the cue onset (t = -3.51, df = 15, p < .01). Taken together, the 4- and 9-month-old evidence is consistent with the previous results suggesting that infants show more rapid facilitation to the cued location with increasing age . This pattern could account for the fact that 9-month-olds shift attention faster than do 4-month olds. However, in Experiment 1 of Johnson and Tucker , 4-month-old infants showed facilitation to a cued location when a target appeared 200 ms after cue onset and inhibition to the same location when the target appeared 700 ms after the cue onset, while 6-month-old infants showed evidence of inhibition, but not facilitation. The observed developmental lag between Johnson and Tucker  and the present study could be due to the different balance of attractiveness between fixation stimuli and cue. One possibility is that our fixation stimuli might be too attractive to disengage and that it takes time to shift attention to a spatial location. One conclusion of the present study is that mechanisms inhibiting imitation behaviors might not be linked with IOR-related mechanisms. However, they might have some relationship with the cortical control of eye movement or the neural development of disengagement. We speculate that the interaction between the neural basis for early imitation and cortical development could cause a developmental change in the expression of competence for imitation . Nevertheless, as much controversy surrounds both the nature of the early imitative capacities [13, 38] and the neural basis of eye movement and attention , further research is clearly needed in order to verify our hypothesis that neonate imitation could remain hardwired and subsequently come under cortical control. Fourteen 4-month-old infants (11 male, 3 female: mean 134.8 days; range 120 – 146 days) were tested. Ten 9-month-old infants (6 male, 4 female: mean 291.9 days; range 274 – 305 days) were also tested to confirm the development of IOR. Infants were recruited through newspaper advertisements. Criteria for admission into the study were no known birth or other kinds of complications, full term (more than 37 weeks gestation), and normal birth weight (2500 g-4000 g). The data from another six 4-month-olds and four 9-month-olds were not included because they successfully completed only less than half of the IOR task trials. The session, which consisted of IOR and imitation experiments, was scheduled during the infants' most alert time of the day for approximately 30 min. If the infant was in a bad mood or not in an alert state, the session was rescheduled. Upon arrival at the experiment room, the experimenter explained the general procedure to the mother while a research assistant handed the infant some warm-up toys to play with. After the infant seemed acclimated to the room and research assistant, they were escorted to a semi-dark space surrounded by a blackout curtain. After completing the IOR experiment, while being soothed by the mother, the infant was taken to the place for testing imitation behaviors. During the experiments, the mother was near the infant but out of sight. At the end of the session, the mother was given the Infant Behavior Questionnaire-Revised (IBQ-R Japanese version) and asked to complete and return it. The infant sat in a baby chair 65 cm from the color monitor of an AV tachistoscope (IS-702) in a semi-dark room. The experimenter outside monitored the subject's eye movement through a video camera (DCR-VX1000) mounted above the monitor, and controlled stimulus presentation on the monitor by means of a microcomputer (FMV-S167). The presented stimuli were superimposed synchronously on video images of the eye movements and recorded on videotape (DCR-TRV 30). The central fixation stimuli were given on the color monitor, and the peripheral stimuli were reflected in a first-surface mirror on the left or right side (Figure 5) in order to be presented at a distance from the central fixation of approximately 30 degrees. Schematic representation of stimulus presentation system for infants. The procedure of the IOR task (Figure 6) followed that of Johnson and Tucker . The experiment consisted of a total of 32 trials. The centering fixation stimuli were composed of brightly-colored moving abstract figures and subtended 5 degrees of the visual angle. They were accompanied by a sound. While the infant looked at fixation, the experimenter pressed a key. The key press initiated presentation of the cue, a yellow diamond of 3 degrees, on one of the two sides. The peripheral cue was presented for 100 ms at the same time as the central fixation. Following offset of both the central stimulus and peripheral cue, there was either a 100-ms or 600-ms gap before the presentation of the bilateral target. The target was composed of colored moving abstract shapes associated with auditory signals, and the two sides were always identical. Thus, trial types were either after a 100- or a 600-ms delay before target presentation, on either the right or the left. These trial types were assigned following a pseudorandom schedule balanced within 4 trials each. Sequence of stimulus presentation used in the experiment. The first 24 out of 32 trials were coded by persons not directly involved in the experiment. Following Johnson and Tucker , those trials in which the infant's gaze moved directly from fixation to one of the target locations were analyzed regarding the direction of the saccade (cued and opposite) and the reaction time (RT; in video frames, with each frame being 33 ms). Trials in which the gaze deviated from the direct path to the target were not included in the analysis of IOR. The reliability between two coders was examined with .90 agreement as to whether or not the trial was adequate and with .94 correlation between the RTs of the adequate trials. 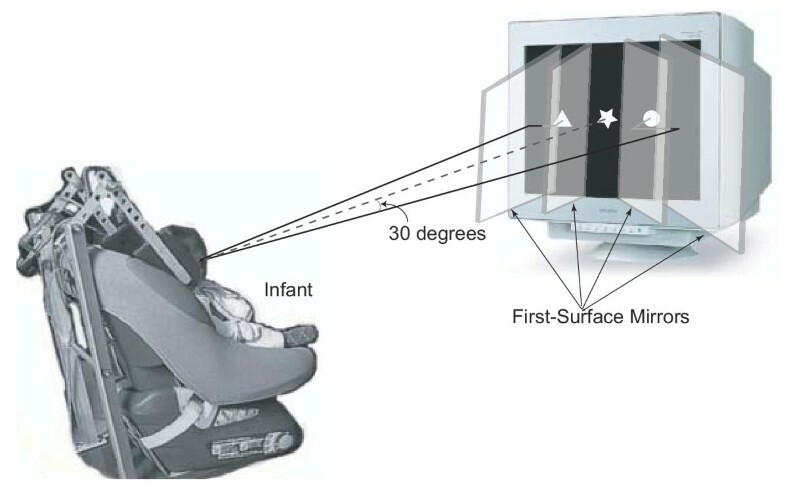 The pilot study suggested that the facial gesture of the experimenter was less able to keep the 4-month-old infant's attention when seated semiupright in a baby chair. Therefore, the infant was placed on a small bed (70 cm × 120 cm × 40 cm) in the supine position. No subject could turn over in bed. The experimenter bent forward and faced the infant at a distance of approximately 30 cm. The second experimenter videotaped the subject's reactions using a portable digital video recorder (DCR-TRV30) from above the infant's head at an angle of approximately 60 degrees. He zoomed in on the infant's face, monitoring by means of the liquid crystal picture provided by the recorder. A research assistant reported the elapsed time, and her voice report was also recorded by the same video recorder. When awake and calm, the infant was placed on the bed. A research assistant attracted the infant's attention by calling his/her name. Once the subject fixated on the experimenter, the observation period (60 sec) began when the experimenter presented a passive face (lips closed, neutral facial expression) to the infant. This established the baseline (B) for recording the infant's spontaneous gestures. Following this, the first gesture (mouth opening or tongue protrusion) was presented by the experimenter approximately four times in a 15-sec period. If the subject turned his or her gaze away from the experimenter, the subsequent gesture was not presented until the subject's attention again returned to the experimenter. This modeling period (M) was extended within this single presentation, until the subject was judged to be attentive to the stimulus four times. After this modeling period, the subject was allowed a 30-sec response period (R), during which the experimenter wore a passive facial expression. A second and different gesture was presented using the same procedure approximately 30 sec after the response period for the first one. The two facial gestures were modeled in random order. Infants' responses were coded in random order by two scorers who were thoroughly familiar with the scoring system but blinded to the modeling. The scorer viewed the videotapes at a speed of her own choosing (from real time to frame by frame) and recorded all instances of infant mouth openings and tongue protrusions every three seconds. We referred to the previous studies for operational definitions for recording [2, 7]. A mouth opening was defined as a separation of the lips, which is initiated by a drop of the jaw from a closed position. For infants who always maintained a small crack between their lips, the minimum separation of the lips during the baseline was defined as a closed position. Yawning was not included as an adequate mouth opening response. Tongue protrusion was defined as protrusion of the tip of the tongue beyond the back margin of the lower lip. It was also scored when the tongue moved forward in the open mouth but not beyond the lips. To make it easier to determine imitative behavior in the 4-month-old infants, we did not consider the quality of the responses (e.g., full or partial reproductions). A coincidence between reported frequencies every three seconds of two coders was evaluated with Peason's correlation coefficient. The r is .58 (N = 162, p < .001). The total frequency of each relevant behavior was obtained for the modeling & responding and baseline periods. An index of imitation was constructed from these frequencies exploratively. It was computed by subtracting the number of target gestures per second produced during the baseline period from the number of those gestures per second produced during the modeling & responding period. As the positive number (>0) indicates that infants show imitative behaviors, the larger the positive number is, the stronger the imitative tendency is. The task was given in a small space surrounded by a blackout curtain and one-way mirror. During the task the infant was seated on his or her mother's lap across a square table (.75 × .75 m) from the experimenter. The video camera which was focused on the subject was behind and left (.85 m) of the experimenter. Four novel objects were modified from marketing toys as stimuli. The first object was a blue plastic toy with a guitar shape (15 cm in length, 2.2 cm in thickness) with a green button (3 cm × 2.3 cm) in the middle. The action demonstrated was pushing the button, which produced an electronic sound. The second object was a plaited quoit (10 cm in diameter) and a red hob (20 cm high). The action demonstrated was to place the quoit over the hob. The third object was a piece of a thick white paper (24 cm × 13 cm) with the handle of a colorful wooden clacker (12 cm × 3 cm) attached to it. The action demonstrated was to turn the clacker from right (left) to left (right), like turning the page of a book, which made a sound. The fourth object was two wooden blocks. The unpainted piece was a cylinder (3.5 cm high, 3.5 cm in diameter) with a hole in the center (2.5 cm in diameter). The other red piece (6 cm high) was in the shape of a nose cone. The action demonstrated was to put the red nose cone into the unpainted cylinder. The pilot study confirmed the low spontaneous probability of infants producing the target actions to each object. During the demonstration session, the experimenter modeled the target action three times in 20 sec. At the end of each modeling period, the object was placed in front of the infant for a 20-sec response period. Three scorers who were blinded to this project viewed responses and provided a dichotomous yes/no code as to whether the infant produced the target action with each object. If two out of three scorers coded yes, that infant's response was evaluated as imitating. As each infant was presented with four test objects, s/he could duplicate 0–4 of the target behaviors. Each infant's response was classified as either "low" (0–2 target behaviors produced) or "high" (3–4 target behaviors produced). This is a revision of a widely used parent-report measure of infant temperament, the Infant Behavior Questionnaire (IBQ) . It contains fourteen sub-scales (Table 1). This work was supported by a grant-in-aid for research from Nagoya City University and a grant-in-aid (No. 13871011) for scientific research from the Ministry of Education, Culture, Sports, Science and Technology of Japan. We thank Kazuo Koga for suggestions for analyzing eye movement, Norman Cook for comments on an earlier draft of this paper and Seiichiro Iwamoto for technical assistance. AN designed the study, carried out the experiments and wrote the manuscript. MS generated the method for eye movement, assisted with running subjects and performed the statistical analysis. OB participated in the design of the study, running subjects and helped with the data analysis for imitation.